We’d love your help. Let us know what’s wrong with this preview of Miracle in a Dry Season by Sarah Loudin Thomas. To ask other readers questions about Miracle in a Dry Season, please sign up. I dearly wish I could give this book 10 stars. It is Sarah Loudin Thomas's debut novel and if this is how she writes, she's on my favorites list from now on! The book is set in 1954 Wise, West Virginia. Perla Long has come to Wise to stay with her Aunt Delilah and Uncle Robert. With Perla is her 5 year old daughter Sadie. Perla is hoping her past mistakes will be hidden in this town. Casewell Phillips is a bachelor and he figures he always will be. He meets Perla and she's just what he thinks a wo I dearly wish I could give this book 10 stars. It is Sarah Loudin Thomas's debut novel and if this is how she writes, she's on my favorites list from now on! Casewell Phillips is a bachelor and he figures he always will be. He meets Perla and she's just what he thinks a woman ought to be. He can't quite wrap his head around the fact that he believes she is hiding something serious. Wise is in the midst of a horrible drought. Crops are dying, cattle are dying and food is scarce. Perla's gift, a very unusual gift, can help the town, but everyone seems to see the worst in her, instead of being grateful for help when they need it. I read a lot of books. A LOT. This book moved me so deeply and profoundly, that it's very hard for me to describe how wonderful it is. Ms. Loudin Thomas has an incredible gift for putting words on a page. I wanted to go to Wise, West Virginia and meet some of these people. I loved nearly all them. The Talbot sisters, Frank, Emily and John Phillips, Delilah and Frank, Perla, Sadie and especially Casewell Phillips. The book is told from mostly Casewell's point of view. That's different because most Christian fiction concentrates on the female's point of view or shares with the male. But the reader gets to know Casewell quite well. He is a strong man, a very spiritual man who values his relationship with Christ above all others, always seeking to please God with his life and every action he takes. Perla tries to be in the shadows, but she has such a giving heart, but at the same time, she just can't seem to forgive herself for her past mistakes. It seems people react in anger and judgment every time they hear of her or see her. What can she do? Must she leave another town? One early endorser of this book said it had 'just a touch of the Divine.' I must differ. This book is guided by the Divine all the way through. God's will is sought by Casewell in everything and His life is guided by God. But he also submits to God his own will. This book is as rich as deep as Perla's chicken pot pie and peach cobbler. I found myself smiling often and crying a lot. This was just such a wonderful book. I am not a creative person and feel that I can't do the book justice with this review. It is heart felt, charming and down to earth. It is enriching. It is a story of God's redemption, grace, mercy and healing and forgiveness. It has a great truth to teach if the reader will listen and put this lesson into application in their own lives. I know it did mine with a problem I've been struggling with. If you only read a few books a year, read this one. I am definitely giving it pride of place on my shelves and I eagerly anticipate the next offering from Sarah Loudin Thomas. SUMMARY: It's 1954 and Perla Long's arrival in the sleepy town of Wise, West Virginia, was supposed to go unnoticed. She just wants a quiet, safe place for her and her daughter, Sadie, where the mistakes of her past can stay hidden. But then drought comes to Wise, and Perla is pulled into the turmoil of a town desperately in need of a miracle. Casewell Phillips has resigned himself to life as a bachelor...until he meets Perla. She's everything he's sought in a woman, but he can't get past the sen SUMMARY: It's 1954 and Perla Long's arrival in the sleepy town of Wise, West Virginia, was supposed to go unnoticed. She just wants a quiet, safe place for her and her daughter, Sadie, where the mistakes of her past can stay hidden. But then drought comes to Wise, and Perla is pulled into the turmoil of a town desperately in need of a miracle. 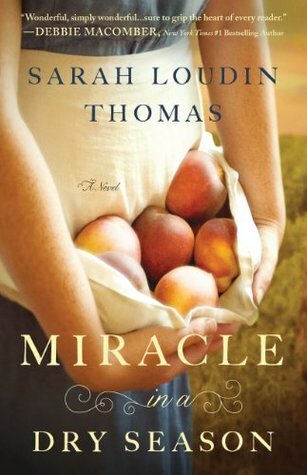 REVIEW: Focusing on the themes of judgment, second chances, and miracles, Thomas' debut novel is a poignant tale of a young woman who made a mistake but has been gifted by God with the miracle of loaves and fishes. Her portrayal of southern small town charm, closeness, gossip, and judgment captured the identity of the 1950's in a timeless fashion that still exists today. The reader will experience the gamut of emotions, anger, laughter, joy and sadness, as Thomas weaves her tale of Perla and Casewell. They both teach and learn the lessons of judgment, second chances and miracles that make them stronger people and better Christians. Lots of great secondary characters as well, and I definitely hope a sequel is in the works. FAVORITE QUOTES: "It is a gift......But I don't suppose it will make a bit of difference. There are some things you can never apologize for. "I thought I was a Christian most of my life, though I didn't see as that guaranteed me a spot in heaven. I figured that dunking I got when I wa a boy made me good enough for church, but maybe not good enough for God himself. Well, I ain't good enough. Never have been, never will be....I still ain't good enough, but I reckon as long as I walk through the pearly gates on Jesus' coattails, I don't hafta be." "All too often sorrow and joy come skipping into your life holding hands." Miracle in a Dry Season is a tender story about the healing that comes through forgiveness. Both forgiving others and forgiving one’s self. Flush with scripture, the novel stays true to God’s design for repentance and restoration. The book’s characters are heartwarming and genuine representations of times past, but their battles are the same that we fight today – lips that spread gossip, unrepentant hearts, and religious self-righteousness. Thomas gives her readers an intimate look into their mot Miracle in a Dry Season is a tender story about the healing that comes through forgiveness. Both forgiving others and forgiving one’s self. Flush with scripture, the novel stays true to God’s design for repentance and restoration. The book’s characters are heartwarming and genuine representations of times past, but their battles are the same that we fight today – lips that spread gossip, unrepentant hearts, and religious self-righteousness. Thomas gives her readers an intimate look into their motives and self-doubts. You will laugh! You may pause to examine yourself and you may even shed a tear. In this, her debut novel, Sarah Loudin Thomas leaves me anxiously awaiting her next work. Miracle in a Dry Season – Releases August 5, 2014 – Bethany House. "It's 1954 and Perla Long's arrival in the small town of Wise, West Virginia, was supposed to go unnoticed. She just wants a quiet, safe place for her and her daughter, Sadie, where the mistakes of her past can stay hidden. But then drought comes to Wise, and Perla is pulled into the turmoil of a town desperately in need of a miracle. Casewell Phillips has resigned himself to life as a bachelor...until he meets Perla. She's everything he's sought in a woman, but he can't get past the sense that she's hiding something. As the drought worsens, Perla's unique way with food brings both gratitude and condemnation, placing the pair in the middle of a maelstrom of anger and forgiveness, fear and faith." I was very surprised that this was this authors debut novel because I will say this was one excellent read from start to finish. You will be presented a novel that has miracles, romance, humor and lots of drama and forgiveness . You will be quickly taken in with Perla Long's story and the way she was treated by the town folks for being a unwed mother. However, Perla had something that many of the town people did not have. What was that? The author did a wonderful job at bringing out the description of the Appalachia area and drawing the reader into the mix of what all was going on. I liked how the author was able to bring Casewell Phillips and Perla together which was no easy task. Now I don't want to give too much away other than say you must pick up the good read to see how the wonderful story will be presented. After going through emotions, judgmental characters will there finally be forgiveness and miracles for this small town of Wise, West Virginia for Perla and her daughter? By the end of this novel you are made to feel like this was a good story of love and faith. So, if you are looking for a wonderful read of a Christian Fiction setting in 1950's with a light romance then I would recommend "Miracle in a Dry Season" to you. This was a good book. Not overly well written, but well thought out and a good story with life lessons to ponder. There were allegories throughout the book. An example of our debt which Christ paid...and a similarity to the miracle of feeding the 5000, of a dry season in our lives by insidious sin that goes unnoticed, of evil being cast out, and of the long awaited rain as a symbol of being washed clean after repentance. This is the part that was well thought out. Set in the 50's (but hone This was a good book. Not overly well written, but well thought out and a good story with life lessons to ponder. Set in the 50's (but honestly, if there were horses and buggies it could have been set in the 1800's by the small town atmosphere). Casewell and Perla are the main characters. The story is written from Casewell's point of view. Perla was new to town, staying with her Aunt and Uncle for a time to get away from the judgement of her hometown. She has a little girl and no husband, so rumors start flying. Casewell is a single man in his mid-30's and an elder in his small church. At first he's attracted to Perla, but when it's evident this child's was fathered out of wedlock he changes his esteem of her. She's upfront about it with him because she felt honesty was the best, but his reaction hurt her. He wasn't mean, he just said it was a lot to take in, that he appreciated her honesty, but wondered how she could not regret sinning against God. He had no clue how this affected her because she continued to be kind and giving and respectful to everyone, despite the snubbing she received daily. Little by little Casewell begins to realize her worth, and how all sin is alike in God's eyes, and that he's no better than she. If not for him, the town would never know their sin toward her. It's slow going, and not only do rumors fly, but accusations and lies are thrown around. And the pastor? Oh don't get me started on that sinful piece of work! As with many books, there were slight writing problems... like history between events. (How did we get here? Nothing lead into it!) And the whole town was so sinless that they couldn't accept a repentant woman who had a child out of wedlock? Lots of focus on that. But the gospel was presented a number of times, and the sin of judgment was a great focus (these people had whole logs in their eyes they couldn't see beyond, but they vilified this poor girl who made a mistake and continues to suffer the consequences for years). If Miracle in a Dry Season were a painting, then I would hang it in my home as a centerpiece among family portraits to showcase my heritage. Within the pages of this beautiful tale is the heart of a people closely related to those from whom I descend. With grace and charm, Sarah Loudin Thomas writes beyond the stereotypes of Appalachia and carries us to a place both real and fanciful, where we experience what has been and what could be. The special gift of the heroine transforms the book into an If Miracle in a Dry Season were a painting, then I would hang it in my home as a centerpiece among family portraits to showcase my heritage. Within the pages of this beautiful tale is the heart of a people closely related to those from whom I descend. With grace and charm, Sarah Loudin Thomas writes beyond the stereotypes of Appalachia and carries us to a place both real and fanciful, where we experience what has been and what could be. The special gift of the heroine transforms the book into an authentic mountain yarn lending it a touch of the supernatural to ease the hardships doled out by this life. The true miracle of this story is not divine intervention upon the laws of nature but the transformation of hearts. Thomas does not preach God’s love to us, rather she shows us through flawed characters living in an imperfect world, who learn how to forgive and to love. The lessons of this book are subtle and inspiring. You will be carried away to Wise, West Virginia where you will find friends to cheer for and a little extra peace for your soul. And if like me, you have roots in those hills, you may even find yourself both smiling and crying at those parts that feel very close to home. It's 1954, and Perla Long was hoping that her arrival in the small town of Wise, West Virginia, would go unnoticed. She just wants a safe place to raise her daughter, Sadie, where her past can stay hidden, but soon there is talk among the townspeople that Perla is a "harlot". Casewell Phillips has resigned himself to be a bachelor, until he meets Perla. She's everything he's wanted in a woman, but he senses she is hiding something. When the drought worsens, he sees that Perla has a unique gift; o It's 1954, and Perla Long was hoping that her arrival in the small town of Wise, West Virginia, would go unnoticed. She just wants a safe place to raise her daughter, Sadie, where her past can stay hidden, but soon there is talk among the townspeople that Perla is a "harlot". Casewell Phillips has resigned himself to be a bachelor, until he meets Perla. She's everything he's wanted in a woman, but he senses she is hiding something. When the drought worsens, he sees that Perla has a unique gift; one that will divide the town in two. Some people accept it with gratitude, and others condemn her for it. Casewell and Perla find themselves in the middle of a storm of anger and fear, while others are offering faith and forgiveness. Deep and thoughtful writing depicts a simpler time, but with timeless conflicts faced by the community and the individuals in it. There is a heavy focus on themes of judging and the need for forgiveness- of others and self. Casewell has a genuine heart that is seeking for truth as his perceptions shift and he allows his heart to open. Perla is bravely trying to start over and provide for her daughter. There is a sense of desperation that increases with the drought and the division of loyalties, Deep and thoughtful writing depicts a simpler time, but with timeless conflicts faced by the community and the individuals in it. There is a heavy focus on themes of judging and the need for forgiveness- of others and self. Casewell has a genuine heart that is seeking for truth as his perceptions shift and he allows his heart to open. Perla is bravely trying to start over and provide for her daughter. There is a sense of desperation that increases with the drought and the division of loyalties, but in the situations where Christ-like love is given and shared, peace prevails until the miracle everyone is praying for comes to pass. A somewhat leisurely pace throughout the whole book, but the insights and reflections call for it. I loved the theme of judgment throughout the book. All of us fall short and who are we to judge? I also enjoyed the literary feel of the book and several secondary characters such as Sadie, Liza, Angie & Frank. On the flip side, parts of the story seem disjointed to me and took away from the flow of the novel. Overall, it was a good read. I'd heard so much about this book, and I'm glad I finally got to it. It was rich and very good. Beautiful. I laughed. I cried. I felt this novel deeply. It was enlightening to realize how judgemental Christian are! This book touches home and convicted me through out the book! Great job! I will be reading your books in the future! I really enjoyed this book set in a fictional town in West Virginia. The author is from the county I now call home, so that added to my enjoyment of the book. I recognized the attitudes displayed by the characters and enjoyed the redemption they received from each other and God. I recommend this to anyone who enjoys Debbie Macomber, Jan Karon, or the Grace Chapel Inn series. One tiny complaint is that the author used you'ns instead of y'all which is most commonly used around here. (I said it was I really enjoyed this book set in a fictional town in West Virginia. The author is from the county I now call home, so that added to my enjoyment of the book. I recognized the attitudes displayed by the characters and enjoyed the redemption they received from each other and God. Thomas's beautiful language will draw you into this Appalachian community. A beautiful, gentle story about grace, love, and seeing beyond ourselves. The publisher kindly provided a free copy in exchange for voluntarily reviewing and promoting. I'm sorry I took so long, long TBR list. I enjoyed the book full of love, emotion, inspiration, and forgiveness. Looking forward to next book! What a powerful and poignant story of family and forgiveness! Some novels are especially good at wrapping you up in an atmosphere – Miracle in a Dry Season does just that. It only took a few pages of reading, and I suddenly found myself enmeshed in the nostalgic 1950’s small town setting of Wise, West Virginia. From the rural lanes to the laid back, everyone-knows-everyone town streets, Wise is filled with the charming sweetness that comes with small towns. However, like any small town, the petty judgments that arise can alienate even the kindest soul, and Some novels are especially good at wrapping you up in an atmosphere – Miracle in a Dry Season does just that. It only took a few pages of reading, and I suddenly found myself enmeshed in the nostalgic 1950’s small town setting of Wise, West Virginia. From the rural lanes to the laid back, everyone-knows-everyone town streets, Wise is filled with the charming sweetness that comes with small towns. However, like any small town, the petty judgments that arise can alienate even the kindest soul, and any event out of the ordinary brings strife to even the most charming of places. Perla came to this town hoping to escape the sins of her past, never imagining the extent to which they would follow her. Caswell thought himself to be forgiving and free of judgment, but realizes just how shallow his forgiveness runs when he meets Perla and her young daughter, Sadie. Perla and Caswell are tested even further when Perla’s gift of taking a little food and turning it into a lot is brought the attention of a town dried up by drought. I loved the whimsical nature of Perla’s gift, the details of Caswell’s carpentry and even the personality of Caswell’s gruff father. If anything kept me from rating this higher, it was the fact that I found the story to revolve more around Caswell than Perla. If I had been expecting that, it may not have bothered me as much, but from the back copy, it seemed like the story would focus of both of them equally. I didn’t really get to know Perla in the way that I wanted to, and I found some of Caswell’s story to be repetitive. Overall, they were endearing characters, and the secondary characters were varied and unique as well. The pacing is slower in this story, but it seems to match the setting and the tone, so I didn’t really mind that. The most beautiful aspect for me were the themes of forgiveness and not casting judgment. They were woven in easily into the story; it all grew organically throughout the events in the story. I look forward to seeing what else the author pens next; I definitely hope to read the next book in this series. Miracle in a Dry Season is the first book in Sarah Loudin Thomas’ Appalachian Blessings series, and is also the first book I have ever read by her. I wasn’t entirely sure what to expect going in, but I have to say, I was pleasantly surprised by this novel. I actually really enjoyed this sweet story, and will have to add Sarah to my list of favorite authors. She did a fantastic job of tying this story together, and I loved how she weaved in miracles, the drought, and Perla’s gift. It really made Miracle in a Dry Season is the first book in Sarah Loudin Thomas’ Appalachian Blessings series, and is also the first book I have ever read by her. I wasn’t entirely sure what to expect going in, but I have to say, I was pleasantly surprised by this novel. I actually really enjoyed this sweet story, and will have to add Sarah to my list of favorite authors. She did a fantastic job of tying this story together, and I loved how she weaved in miracles, the drought, and Perla’s gift. It really made for a very interesting plotline that kept me captivated until the very end, especially since there were a few unexpected twists and turns there near the end. Perla Long is definitely a very sweet character, and I couldn’t help but love her and feel so much compassion towards her situation, especially since she felt so down upon herself because of other’s—somewhat wrong—opinions of her. She does her best though, by Sadie, and her aunt and uncle, and everyone else around her, and I really admire her for that. Her love and compassion for others made her all that much more lovable of a character, and that only helped to make this story that much more enjoyable. Casewell Phillips is also a wonderful character. Though he does take a while to come around when it comes to Perla, he most certainly makes up for it in the end, and I couldn’t help but loving him no matter what his struggles. He proved to be a wonderfully sweet character who truly cared for those around him, especially his parents, and I really loved watching his love for Perla grow as the story progressed. All in all, I really enjoyed this story, and can’t imagine giving it anything other than all five bookshelves. I really enjoyed the way this story progressed, and by the time I had finished this novel, I couldn’t wait to read the second book in the series. I’ve already finished it, if that is any indication as to how excited I was for it. Anyway, I’d highly recommend this novel, as it is super sweet and captivating, and I can’t wait to read even more novels by Sarah in the future! A gently charming story of faith and forgiveness, "Miracle in a Dry Season" is a promising debut from author Sarah Loudin Thomas. In the mid-1950's of rural Appalachia, in the little town of Wise, West Virginia, a miracle is beginning to take shape. Folks don't know what to expect from single mother Perla Long and her young daughter Sadie. Trying to put the mistakes and misconceptions of her past behind her, Perla hopes to quietly settle into the community, finding shelter with her aunt and uncl A gently charming story of faith and forgiveness, "Miracle in a Dry Season" is a promising debut from author Sarah Loudin Thomas. In the mid-1950's of rural Appalachia, in the little town of Wise, West Virginia, a miracle is beginning to take shape. Folks don't know what to expect from single mother Perla Long and her young daughter Sadie. Trying to put the mistakes and misconceptions of her past behind her, Perla hopes to quietly settle into the community, finding shelter with her aunt and uncle. At the age of thirty-five, Casewell Phillips sees lifelong bachelorhood looming before him--until he meets pretty Perla and sweet Sadie. While speculation runs wild about Perla's status as an unwed mother, Casewell is wrestling with feelings of attraction and guilt over his own doubts about Perla. However, the more time he spends with mother and child, the more he longs to have them for his own family. Perla, who needs no one else to remind her of her indiscretion, feels unworthy of a man such as Casewell. Trying to repay the kindness of her aunt and uncle, Perla does what she does best--she cooks. Preparing food is a transcendent experience for her, and the food she prepares never seems to run out until all are fed. When a devastating drought causes much hardship for the community, Perla's almost magical way with food comes under superstitious scrutiny. Is she a witch with evil intent, or is she heaven-sent? Will the townspeople look into their own hearts and seek forgiveness for their own missteps and lack of faith? Can Perla take a leap of faith and accept the love of the good man who wants both her and Sadie in his life forever? A touching and endearing well-told tale from debut author Sarah Loudin Thomas. Realistic and powerful themes are found in the pages of Miracle in a Dry Season. The book is set just after the Korean War and reflects many of the beliefs and customs of the time period. Perla left her parents home hoping to escape the scorn and gossip surrounding her because she was an an unwed mother. She hoped to give a better life to her daughter, Sadie. She hoped to find peace and happiness in a town where her past was not know and she could be free. Bad news and gossip followed her to Wise Realistic and powerful themes are found in the pages of Miracle in a Dry Season. The book is set just after the Korean War and reflects many of the beliefs and customs of the time period. Bad news and gossip followed her to Wise, West Virginia. She soon became the center of animosity when some blamed her for the drought. The pastor suggested that the sinner be exiled from their presence, so God would stop punishing the town. No matter how much she tried to help the people, there are always some who try to put someone else down to make themselves feel better, and Perla was caught in the cycle. Casewell had dreamed of finding a virtuous woman to settle down with and have a family. Somehow it was Perla that he dreamed of and she soon became the focus of his attention. He couldn't let himself have a future with her, because she was a "fallen woman". This book centers of the need for understanding, forgiveness, repentance, love, and the destructive power of gossip. I loved the groundwork that Sarah Loudin Thomas laid in showing a small town society where religion is a strong center of the community. Many characters are lovable. Sadie pretty much stole the book for me. Children will often be the teachers of adults, they love unrestrained and are innocent. I'm grateful for the opportunity that I had to read this book. It has given me a few things to ponder. Though I struggled to get into Miracle in a Dry Season in the early pages, I soon found myself swept into Wise, and I couldn't put the book down. In Casewell's journey from judgement to grace, author Sarah Loudin Thomas paints a powerful—and convicting—picture of what our own Christian walks should look like. Maybe you don't struggle with extending grace to other believers, but I sure fall on the side of judgement far too often. This lesson—which I seem to need to learn over and over again—is wra Though I struggled to get into Miracle in a Dry Season in the early pages, I soon found myself swept into Wise, and I couldn't put the book down. In Casewell's journey from judgement to grace, author Sarah Loudin Thomas paints a powerful—and convicting—picture of what our own Christian walks should look like. Maybe you don't struggle with extending grace to other believers, but I sure fall on the side of judgement far too often. This lesson—which I seem to need to learn over and over again—is wrapped in a wonderfully compelling story. Really, Miracle in a Dry Season is a beautiful novel. It has a literary fiction feel to it that I don't encounter too often in Christian fiction. (The last book I can remember reading that had this same overall feel—though it was completely different—is Christa Parrish's Stones for Bread.) It's a book that I could send to my literary snob sister, and I'm confident she would love it as much as I did. Miracle in a Dry Season is a special novel, the likes of which you don't see every day. I'm thankful that this is just the first book in a series, as I'm anxious to return to Wise! Perla and her daughter, Sadie, came to Wise, West Virginia, to escape the past. Perla’d fallen for a married man – one of the oldest stories in the world – and got pregnant. Ostracized by her town and her parents, she came to Wise to live with an aunt and uncle. Unfortunately, as pasts often do, hers followed her. Coming to care for Casewell Phillips, long-resigned to being a bachelor, Perla confesses her situation to him and immediately was judged for what she had done. How Casewell comes to un Perla and her daughter, Sadie, came to Wise, West Virginia, to escape the past. Perla’d fallen for a married man – one of the oldest stories in the world – and got pregnant. Ostracized by her town and her parents, she came to Wise to live with an aunt and uncle. Unfortunately, as pasts often do, hers followed her. Coming to care for Casewell Phillips, long-resigned to being a bachelor, Perla confesses her situation to him and immediately was judged for what she had done. How Casewell comes to understand Perla, how Perla comes to understand herself, and how Sadie changes even the most hardened character is the stuff of miracles. You’ll enjoy coming to know these people and wonder at the prejudices and superstitions that still ran rampant in 1954. This is a debut novel for this author. The author brings a touching story about a small community set in 1954. It's a story that will evoke many emotions and grab your heart. This story is wonderfully written. It's about new beginnings, trust, forgiveness, love and faith. The well developed characters will pull the reader in, but the vivid imagery and great storyline keeps them turning the pages. Perla Long is looking for a fresh start for both she and Sadie, her daughter. She has made mistakes This is a debut novel for this author. The author brings a touching story about a small community set in 1954. It's a story that will evoke many emotions and grab your heart. This story is wonderfully written. It's about new beginnings, trust, forgiveness, love and faith. The well developed characters will pull the reader in, but the vivid imagery and great storyline keeps them turning the pages. Perla Long is looking for a fresh start for both she and Sadie, her daughter. She has made mistakes in her life, but truly doesn't want them to define her entire life. Moving to Wise, Virginia to live with her aunt and uncle is the first step in making a new life for them. Unfortunately tight lipped gossips and self righteous people begin to questions everything about Perla and her daughter. Can Perla and Sadie have a new start? Who can Perla trust? Does she have enough faith to see her through these trying times? Can she forgive those she has wronged or who have wronged her? Will she find love? I was given this book by Bethany House through Book Club for a honest review free of bias or outside influence as stated above. A Story You Won’t Soon Forget! It is hard to believe that this is a debut book for author Sarah Loudin Thomas. She writes like a seasoned author. Miracle in a Dry Season is a book I won’t soon forget. It packs a message loud and clear on how we should live our lives. The hatred and evil in this story will touch your soul deeply. The goodness in this story will touch your soul deeply. I felt the struggles and trials of all the characters living in Wise, West Virginia. Where was God when the town s A Story You Won’t Soon Forget! I felt the struggles and trials of all the characters living in Wise, West Virginia. Where was God when the town struggled; where was God when the trials began? He was there all along, the people just couldn’t see the big picture of His plan. One of the characters that will touch you is a little girl named Sadie. You will be amazed at what this little innocent child can do and the lives she changes. I will assure you, you will be brought to tears. I highly recommend this book. It is a 5 star book and more. Please don’t miss it! I won this ARC on LibraryThing to read and review. The opinions expressed are mine alone. This is the first books I have read by Sarah Loudin Thomas. The cover drew me in, and being about a town I know in WV, sealed the deal. I am glad I read it. It is set in 1954, in a place called Wise, West Virginia. A single mom recently new to town and the town's bachelor meet at church. All of the rumors and the judgements have been thrown. How do they view each other? The town does have its own issues, views and morals. The story reminds me a bit of the Scarlet Letter..not at all the same read This is the first books I have read by Sarah Loudin Thomas. The cover drew me in, and being about a town I know in WV, sealed the deal. I am glad I read it. It is set in 1954, in a place called Wise, West Virginia. A single mom recently new to town and the town's bachelor meet at church. All of the rumors and the judgements have been thrown. How do they view each other? The town does have its own issues, views and morals. The story reminds me a bit of the Scarlet Letter..not at all the same read but the views. I’m a Christian, wife, fundraiser and writer living near Asheville, NC. I grew up on a 100-acre farm in French Creek, WV. I used to say “rural WV,” but realized that’s largely redundant. I LOVE my home state and the fact that I’m the seventh generation to grow up on the family farm. My love of the Appalachian Mountains informs my writing. I want you to be as wild about these hazy, blue mountains a I’m a Christian, wife, fundraiser and writer living near Asheville, NC. I grew up on a 100-acre farm in French Creek, WV. I used to say “rural WV,” but realized that’s largely redundant. I LOVE my home state and the fact that I’m the seventh generation to grow up on the family farm. My love of the Appalachian Mountains informs my writing. I want you to be as wild about these hazy, blue mountains and the wonderful people who live in them as I am.